There is something special about driving around in a Jeep brand vehicle. Slogans such as “It’s a Jeep thing, you wouldn’t understand,” give a slight inclination into just how unique owning a Jeep really is. When you pass someone on the road who is driving a Jeep, the two of you raise your hands, in recognition of an unspoken bond, that other drivers just wouldn’t understand. Whether you are behind the wheel of a new 2015 Wrangler, or one of the many used Jeeps for sale in Colorado Springs, it doesn’t matter. The connection Jeep drivers have to one another may be unspoken, but it is widely recognized and well known. Jeep is an automotive brand steeped in a rich history, with unique beginnings. Originally created as a military vehicle, the Jeep has come a long way since it was first produced in 1941. 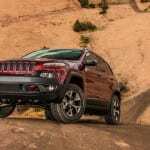 Taking United States soldiers into unpaved territory was the most important mission Jeep has ever embarked on, and drivers of Jeep vehicles are able to connect to that piece of American history more than any other vehicle. Jeep began its automotive history as a military vehicle, but the brand has long since evolved into the many vehicles you see on (and off) the road today. Check out some facts about the iconic brand by exploring the areas below. You may just learn something you didn’t previously know! It has been widely established that the Jeep has a rich history in America. There are other tidbits of information that the American public may be unaware of, but are also important to the history of this iconic car. Check out these five questions below, and learn even more about the Jeep and it’s history here and around the world. How did the Jeep Get its Name? One of the first, and most interesting facts about Jeep, is how it got its name. Originally referred to as General Purpose vehicles by the military, the long name was quickly abbreviated and known simply as “GP.” From those two letters, “Jeep” became slang for the vehicle, which in turn, ended up being the actual name of the general purpose vehicles. Who Makes it? The Jeep brand has been owned by various companies throughout the years. Willys-Overland was the first company to manufacture the Jeep, mainly for Military purposes. American Motors took over the Jeep brand in 1970, before Chrysler bought it in 1987, where it has remained ever since. Despite this ownership trade-off, the Jeep has remained a off-road capable vehicle since it was first produced. What Kind of Award? Most everyone is aware that the Jeep was the signature vehicle of World War II. The vehicle was so important, that Commander Eisenhower said that the Jeep was one of the three most important tools in the war. What many are unaware of, is that one Jeep in particular took home a very prestigious award from that war. The Purple Heart is awarded to soldiers who are injured during combat as a recognition of their bravery. The United States military awarded a Jeep the Purple Heart after it survived two different beach landings during the war. While the Jeep is one of the most awarded SUVs in the world, it is also the only vehicle to ever earn a Purple Heart. A Jeep Sportscar? The Jeep XJ-002 Bolide from 1969, more closely resembled a sports car than the rugged SUV we are used to seeing. This model was still very capable of heading off-road, but got the attention of icons such as Enzo Ferrari, who called this version of the Jeep the only American-made sports car. While his comment may not have been sincere, but rather an insult to the Chevy Corvette, it still stands out in Jeep’s history as another unique highlight for the vehicle. Jeep, or SUV? In the United States, the word “Jeep” is used only to describe the specific brand of vehicle. Around the world, the term is used to name any four-wheel drive SUV that has off-road capability. Moral of the story? If someone in Mexico is selling you a Jeep, make sure you know what you are getting, before you buy! When you own and drive a Jeep, it becomes immediately apparent that you are a part of a special culture of people. The world is now your playground, and your Jeep will take you anywhere you want to go. Drivers of Jeep vehicles, especially the Jeep Wrangler, become a part of a world that other drivers are not privy to. This camaraderie is put into practice with the infamous “Jeep Wave.” So why are Jeep drivers so unique from others on the road? Most Jeep owners crave the great outdoors, adventure, and are spontaneous. They are enthusiastic about the Jeep they drive, and it becomes a part of who they are, not just a means of conveyance. Owning a Jeep is not like owning any other type of vehicle. If you have made the decision to own a Jeep already, then you are well aware of everything we are talking about. You are a part of the culture, you have the Jeep Wave down to a science, and you have already started your adventure. If you are looking into buying a new or used Jeep, Colorado Springs is one of the best places to do so! The mountains, trails, and off-road adventures are endless. For those of you new to the Jeep Culture, or about to join it, check out some tips on how to get started on your newest lifestyle journey. Embrace the Culture: Be proud to own your Jeep. Whether it’s full of mud, or shiny from a new wash, show it off with pride. Jeep vehicles are the only cars on the road designed to be driven without doors. Embrace that, too. Perfect Your Jeep Wave: Wave to other Jeep drivers, and know you are a part of a unique world. This tradition was started 75 years ago, and needs to be carried on for the next 75 years and beyond. Know Your Vehicle: Jeep brand vehicles are unique, and it is important to know everything about your vehicle before you drive it. Learn how to take the top off your Jeep, how to stay connected through Jeep mobile apps, and read your owner’s manual. Know Your Mud: Jeep brand vehicles were made to perform off-road. There are plenty of opportunities to explore off-road paths here in Colorado, but it’s important to be aware of the elements before you go. Carry on Tradition: The Jeep tradition is a good one. You are a part of it now, so carry it on. Head out on the adventure of a lifetime, and be sure to carry on the tradition of Jeep everywhere you go. Unlike other automotive brands, Jeep vehicles get better with age. Driving a rustic Jeep from the past is a great way to connect even further to its history. Used Jeeps are available and for sale in Colorado Springs in a variety of models, colors, specifications, and more. Whether you want a decked-out Grand Cherokee for luxury cruising, or are looking for a rugged fully-capable Jeep Wrangler, used Jeeps are in abundance. Find the perfect Jeep vehicle for your lifestyle, and start making memories.